cgMusic – Can computers create music? Apart from being a programmer and a designer I’m also a kind of an occasional music composer. I have created the entire music soundtrack for Magic Match and many tracks for Saqqarah and some other games, but in most cases I create music for fun. I plan to post my compositions on this blog in the future as well as to write about my experiences concerning making of music for games, but now I’d like to write about a piece of software called cgMusic, which I’ve developed as a part of my master thesis. The goal of the cgMusic project was quite ambitious as I was supposed to create a computer program that would be able to create music with a certain level of quality that most of the existing music generating software lacked. Apart from that, I decided that I would not limit myself to mimicking any particular kind of music and rather make the software universal in such a way that it would be able to create music of any genre. So, did I manage to do it? You can judge for yourself. You can download the program here (0,5 MB), install it and give it a try. At start you can either load any of the preset projects or create a new project by selecting two master algorithms that will create a random song for you. Later you can tweak all the internal parameters to your liking, change the songs arrangement and so on. If you have any questions about using the program, feel free to post them as comments to this article. If you don’t want to download the application here a some compositions created by cgMusic, that I was particularly impressed with. They are in midi format and should play properly on any General Midi compatible device. The internal workings of cgMusic are quite complex. Basically cgMusic is an expert system distributed among many independent modules, where every single module knows how to create one aspect of music. An example would be an algorithm that creates a certain set of possible rhythms, melodies, harmonies, song structures or hole arrangements. The program can easily be extended by adding new modules on the fly and this is how supporting new styles is possible. Each module can be controlled independently so when you decide on a certain melody and structure you can listen to “your” song in any of the available arrangements. For the purpose of my master thesis I created a sample set of plugin modules that show the very basic abilities of the application. It was a nice surprise for me to see that even with very simple algorithms the program is able to create complex music. If you think that music generated by cgMusic sounds crappy this probably because midi music generally sounds crappy. But there is no problem in rendering cgMusic generated compositions using some fancy synthesizers or samplers. Below are a couple of examples in mp3 format that show what kind of effects can be obtained with the usage of proper music rendering tools. There are many potential uses for computer generated music, ranging from real human composer assistance, music production tools, dynamic music for computer games, etc. The main reason behind slow development of advanced new music generating algorithms is that relatively few music composers have the IT based skills and the necessary knowledge to translate their music composition skills into mathematically defined algorithms. Thank you for this wonderful software. I tried many different ones i.e. fracmus, fmusic 19, qfc, gingerbread, etc. This one is superior. Try ‘Modern Song Structure’ 11055 and ‘Simple Ballad Song Arrangement’ 11896! 🙂 This is one of the two best random music creators I’ve ever used. The other was AlgoMusic on the Amiga back in the ’90s. This is an awesome music application, best of its sort that I have come across. Well done and thank you. Now, I am hoping that you will extend it to include extra styles of music, including, perhaps, ones with less emphasis in a melody, such as trance (and similar) and ambient with slower movement of individual parts. But, wow, its good! It’s a wonderful software. I play with it a lot of time, and my son (11 years old) started to write song for his school :D.
First: Sorry for bad English…. Thanks for this wonderful piece of Software. “Music in the Numbers” – simple and really great, but no longer developed. And other ones….and this seems really great. It’s not just clever, it’s sensational! I genuinely enjoy the music it creates. You’ve done an outstanding job. I hope the University appreciated how your softwares’ capability dwarfs any other in the same arena. Is each track it creates truely unique? Thanks for this excellent software.. Wondering if you plan any future development? Thanks for all the kind words about cgMusic. Unfortunately I don’t plan to develop it any further at the moment as I hove a lot of work with our games. (1) when I try to right click on a tree element to access script options, nothing happens. Am I missing something here? (2) are the help files available somewhere in English? (3) where can I find out more about the scripting language? what is it written in? (4) any possibility of a real-time midi-out implementation? (1) Right clicking on a script in a tree view should give you a popup menu with “Edit This Script”, “Duplicate” and “Remove” options. The “edit this script” function requires the freeware CrimsonEditor to be installed(www.crimsoneditor.com). But in fact you can use anything to edit the files on disk like notepad. (3) The embedded scripting language used is angelscript. The syntax is very similar to c/c++. You can learn more about it at angetcode.com/angelscript. (4) Actually when you hit the play button the application sends the events to the default MIDI device set in Windows, so you can redirect it wherever you want. But changing parameters during playback is not possible because it is necessary to recompute the whole song after each change. Beautiful software! I’m working on a similar project with a large format multi-touch interface (see http://www.nuigroup.com). I would love to know more about the architecture of the program. Maybe even a UML diagram? That would be awesome. Do you have English documentation for this program? When I installed, all I see is a couple of doc files that appear to be in Polish. Wonderful software, but how do I use mp3 rendering? I also think, that going open-source is a great idea. I also would be very happy to invest my time in contribution to this software. Genius program, simple and very effective. Well done! I think open source is a great idea too, but I totally understand if you wouldn’t want to release such great code. It’s free, it’s fantastic, thanks again! 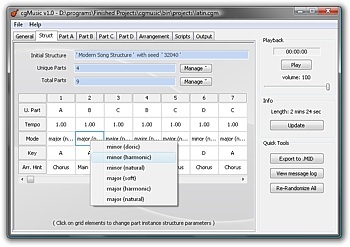 I am an open source music programmer and I recomand you to make your program open source (eg: under GPL license). I think that many developers will make this program even better ( and will make music composers to worry :-)) ) . awesome, reminds me of algomusic on my amiga days, thanks some genius have done such works on days like these. Would be nice to be able to kick in some self made samples, maybe it can and it is just me… anyway congratulations! I am a freeware game developer. I would be interested in using music generated by cgMusic in my games. The games would be distributed, but not commercially. Does this count as personal use? If not, can I get permission to use the music generated in my games? If you choose to reply, please reply to toilethumour#AT#merseymail#’DOT#com. I forgot to mention, you would of course be fully credited. Unfortunately, I am unable to pay for a licence, if one is needed, as I have no method of transferring money over the internet. I came across this while doing some research into procedural/generated/computer music, very cool. Any chance of the (or some of the) source code being open source? Very impressive results! I’ve done some work with algorithmic composition myself. My web application (fractalcomposer.com) generates music using self-similarity. Nice results! Is your master thesis available somewhere online? I’d be really interested in reading it. Kudos for sharing this program. This is the best music generation software I have ever used. You are authentically a genius – really! I’m interested in this field of research. Can I download your master thesis anywhere? you are the man , awesome program. Would you be interested in sublicensing the system/idea ? So what if someone makes a program that can learn receiving input from human who can tell it what it has to “like”? This is the best music generator software I’ve ever used. Period. after only a few hours mucking about I’ve made several enjoyable songs that really seem like they’ve been composed by a human. You may know of this already but there is a man who has developed software that can copy a musician’s style and then use it to elaborate upon a given musical theme. His name is David Cope. Here is a link to some of the compositions produced and I think they are very good (particularly the Bach piece). Thanks for the brilliant and interesting software! This seems like an interesting project, but it’s a shame you’ve only targeted Windows so far. Might I suggest opening the source on the port-resistant interface bits, if not the entire project? I’m sure you’ve done a good enough job of writing portable code for the internal bits, and I know more than a few Linux users (myself included) who would love to tinker with this! Do you know of any fancy synthesizers to use? Is is possible to you to send me the orchestral score of “hapsi_s90es.mp3” and the choral score of “piano_gigastudio.mp3”?? (if available, please) or how to generate them exactly on the CgMusic software. I’m very interested on the quality of those pieces and I would like to analyse them in detail. Hi Ed. You can simply download the piano.mid and hapsi.mid attached in my post and use any program that can print midi files as music notation. The project files are also distributed with cgMusic so you can also load them yourself in the app and save to midi. Best regards. Hello. Great piece of software. I’m wondering if there is any way possible to batch export multiple randomly generated pieces without having to change everything by hand each time. Any help is appreciated. Thank you again for such wonderful work! Hi again, thanks for the reply, but I have problems running CgMusic, it says that MSVCP70.DLL is missing… (both in windows xp sp3 and windows 7 rc). Any suggestions? Excellent quality of music generated. the expert system rules should be well formed given that it is possible to produce human like output from randomization.Would be nice to read the master’s thesis. is it available on the web? Thanks for the good words, sr. Unfortunately the thesis is only available in Polish language and only in the building. Unfortunately this is the current policy as they had problems in the past with people stealing and selling works to students of other schools. I have translated the documentation with the help of Google’s language tools and the result is surprisingly good. This is very interesting. I can create a random siong, export as a midi file, then import the midi file into guitar pro 5, and i have an instant guitar riff(mayby not the best, but how easy!) This software wold be great if t contained different scales (aeolian gypsy pentatonic) woud it be possible to add them into the program… if so, how woud I. ( i have no programming knowledge, but im a quick learner) I would even consider paying for a program which would have the different scales. Please respond! This is one of the best music software ever created. It would be wonderful if you could continue its development or, alternatively, open the source, even with a restrictive licence. Is it possible to use the midis generated by this software commercially, or is it just for personal use? And if only for personal use, do you ever plan to release a program that can be used commercially? Hi! I met Philip Glass (well, I saw him in a restaurant once or twice) and other celebrity composers, but your software is the COOLEST among em all! Genius, thanks! It beats the best of Eno or Nyman anytime! WOW! amazing peace of software. I am musician and know playing keyboard and music theory, chord etc. It is really helping for great ideas. Great job done. This is OK but I still think people are much better at writing music. Havign trouble getting the live play to make a sound although I can easily play any file exported to midi. The program uses standard system MIDI output, so it should work if MIDI is present and configured on the system (the default device is used). It was tested on xp and vista. I have interest in Indian Raga using Sitar. May I request you to assist me in the following please. 1. Is it possible to compose Indian Raga using computer software such as cgMusic which sounds like Sitar? 2. Can I use cgMusic on Windows Operating System? I’m not an expert on Indian Raga, but it should be technically possible, but it would require developing specialized scripts. So it can’t be done out of the box. For the other question – yes, cgMusic works on Windows. This is simply amazing, even with Midi format, some of the songs I got out of it are just awesome as they are, so plan on pulling them apart in my editing programs and seeing what can be done with the tracks. I must rank myself in line with all the other great compliments. I have tried out a lot of automated composing programs, this is really the best. So it is really a shame that you have no time to develope it further. So, no chance for any new structures or arrangements ? Any way for a (non programmer) to write/develope some structures/arrangements ? Thanks again for the great tool ! SoundHelix is another cool tool for generatic algorithmic/random music (Java-based). This is the first software I came across which actually does a good job when it comes to algorithmic / generative composing. I`ve been searching for years for something like this. This will be a valuable asset in my song making process. It gave me new inspiration. You could easily charge money for this. What have you used to write it? Is it open source? oh …. one more thing. i can’t runn cgMusic on my windows xp sp3. there’s a MSVCP71.dll error. I’d very much like to try your programm. I hope it resolves your problem. Great software! Please open source it! I have a question and even if few people already asked it I didn’t found an answer. So forgive me if I am asking something what you answered many times before. Here it is: Is it possible to use music from cgMusic in commercial indie app? Hi Antonin. Unfortunately the music created in cgMusic cannot be used commercially. well, you made me sad but I must respect this. I am wondering if here is a chance to contact you. Thank you for making your excellent program available. Do users of CGMusic have permission to post the musical output from this program to the internet when it is published in this manner non-commercially? Hi Clyde. Yes, you can post music from cgMusic on the internet non-comercially as long as it is clearly stated that the music was generated by cgMusic. Thanks Maciek for your prompt and clear response. I have created a (almost complete) reimplementation of cgMusic in Java. The scripts have been ported to Java. Thanks for teaching me a lot about musical structure, rythms and styles! Hi Per, this sounds very interesting 🙂 I’m glad that cgMusic inspired you to learn so much about generative music programming. I don’t have anything against you publishing what you created, just please make sure to include a note that it’s based on cgMusic. Best regards! Per, looks like you did a lot of work there. I’ll take a closer look at it when I find some time. Best regards! I am trying to take your abstractions of structure, sentences, phrases etc. and plug it into my reactive generative music module. The plan is to create a module for interactive applications like games. Unfortunately, I can’t reuse much of the reimplemented cgMusic code since my method of music generation is different. The music is really bad in that demo but the idea/vision is pretty clear. With better structure, style and “rendering” etc, this can be really cool, thanks to cgMusic! Congratulations for your revolutionnary software ! I’ve never seen a procedural music software as great as this one. It’s even better than some studio music, thank you so much ! I discovered your programme through a piece in Computer Shopper issue 282 August 2011. The MIDI file from any promising result goes to PG Music’s Band in a Box, which I find very useful. If only CG and PG could get together that would be something else. They should head-hunt you. This is damn impressive, I’m blown away!!! Awesome software! What is the license? Please open source! this is so nice that you have defined everything with editable scripts. I added the harmony modules with an “more advanced” chords set and I am really happy with the results. a Question about “AddHarmonic” how do I add out of scale notes to chords ? up.AddHarmonic(CreateTime(0,0), 1, “123567”); In key of c would result as “C major 6/9” . How could I add the d (2) one octave higher, resulting a different sounding inversion ? So what if I wanted to add C# note to that chord what would the notation be ? Hi psavolai. Frankly speaking it’s hard for me to remember such details, it’s been many years since I did cgMusic scripts. But if I recall correctly, the chords in the harmonic part could only contain steps from the selected mode, so I’m afraid it’s not possible to create complex harmonies on this level. But the render algorithms (the ones that write actual notes to the tracks) are free to change the notes as they please and do all kinds of inversions. it’s really awesome, i loved it since the first time i try it, it really helps and will be an incredible tool in game jams. Hi, First of all, great job with the software. I don’t know much about casual games, so I was wondering if casual games submitted to fgl.com are consider commercial. I’ve been doing lots of tutorials and finally I’ve started to create my own game. I’m planing to place it on fgl.com to see if I can sell a licence. Would it be possible to use songs created with this software in my project?. Hi Ryan, I don’t see any problems with you using the songs in your software project as long as you include a statment that the music was generated by cgMusic and link to this page. Wow thanks. You made my day. Then I’m going to keep working on my project and as soon as I finish it I’ll send you a link, so you can tell me if the statement is visible enough and you still allow me to use the music. Thanks a lot. Thanks a lot for sharing your software! I was searching for an example of expert system to quote in a college lecture on management of information technology. Well, for me you sound like a genius! Many thanks for this software masterpiece and best of luck for your job. Hi Maciek! Thanks for your kind reply! I will surely do as you requested. many, many thanks for your generous gift. a real help for serious musicians. Have you considered licensing the output from cgMusic as CC-By? It seems as if in the past you did not want output to be used for commercial works, though now you seem OK with it. There may be enough interest to edit the article with an explicit statement which links to a CC license, applying only to the output of cgMusic and not cgMusic itself. Currently the cgMusic installer executable’s displayed license would contradict that and so it might make sense to simply replace it with a zip including a license.txt with the files rather than making a new installer if that would consume more time than you’re willing to spend. Whichever license you choose or whether you decide to leave it a bit ambiguous, you’ve developed something quite special. – If you’ll update the application please try to make every control accessible via keyboard and the tab cycle. Currently I have to use special screenreader commands e.g. to access the create button in the new project dialog. Beside this the help documents are not in english and therefore not helpful for me. You are right: one should keep in mind that midi music played directly often sounds kind of crappy. I recommend to use an renderer and the free sound font arachno with gave good results for the rock styles. I installed the Microsoft runtime 2010 but it didn’t solve the issue. Any ideas? Man! thanks for this soft, you really deserve an award! I have no idea if you still monitor replies on this site, but I can’t find any other way to contact you. I’ve been a big fan of this program ever since I stumbled across it years ago. Recently I was looking around for other music-generation resources, and I came across this site: http://www.fakemusicgenerator.com/ which claims to generate whole fake albums in an instant. I tried it out and listened to the first song, and within moments recognized the distinctive patterns. This site is using your cgmusic’s algorithms to generate music. I couldn’t tell at all if you were associated with it, but I figured I should let you know. You’ve done an awesome job writing this software! I’ve tried many other algorithmic composition programs. Most algorithmic composition software doesn’t include the factors necessary to make a complete song (without human intervention). It seems as though most other algorithmic composition software is really better for writing motifs. Is your code open source? Thank you very much for providing the software for free. This is very cool. By the way, you said that the music can’t be used commercially, so it means that I cannot sell my game that uses music generated by cgMusic? Hi Maciek, this is literally mind blowing! I recently watched a short doco on the progress of machinery/robotics and computer technology and its impacts on human occupations – it was quite interesting learning that computers were quite capable of ‘creative’ expression (given the right human instruction). I have always wanted to learn to code and create a game, so I decided to start doing that this year. I have been able to begin creating a game but I have struggled with music creation (given that my musical knowledge is quite basic). Watching the documentary, that I referred to, gave me the idea of searching for a program which would procedurally generate music. This led me to come across your program, for which I was able to produce some quite awesome pieces of music, that I felt quite suited the game I was making (I just changed some instruments with Anvil Studio and then ran them through an 8bit filter and was so happy with the results.) I was wondering and hoping that I would be able to use these tracks in my game, which I one day hope to make commercially available… as distant as that dream seems. Obviously you, and your program, would be credited with music production. Anyway, thanks for producing this program, it is quite excellent and regardless, has helped me increase my musical knowledge. Very good job!!! It’s awesome for me. Great music software! Thanks for an amazing program! I stumbled across your program on another site and thought I would give it a try. My initial intention was to use it to practice creating compositions. I found myself doing far more than that! While I did use your program as a basis for my compositions I (after exporting the projects to midi) dissected, rearranged and recreated the individual parts. Using midi, I also created my own parts like Bass, Guitar and Drums, ultimately ending up with my own creations. The reason I am writing here today is because there seemed to be some confusion as to the commercial use of songs created by cgMusic. As you stated in an earlier post “copyright law is very unclear when it comes to algorithmic compositions”. I also understand that the program can give two people identical results if the same random seed is used. Since I used cgMusic as a starting point as opposed to the only point I don’t think this would be an issue. My initial intention was to use proceeds from an album I created to fund future projects but I am not sure that I want to get all wrapped up in the copyright game so, I decided to create computer generated music videos for each song and release them together as sort of a free video album. The only possible income generated from these videos would be in the form of possible advertising revenue generated from YouTube. I don’t think this will be a problem. When the project is complete credit will be appropriately given to cgMusic complete with links. As of this writing, I have not yet uploaded any videos but I did however create a very basic web page with a player on it that contains all 10 songs from the album. I would be honored if you were to visit and listen at your leisure since you were the inspiration for the entire project. P.S. I will re-post a link once the project has been completed and the videos uploaded. OK, here is the update as promised. I must say that I am pleasantly surprised because in just 4 short days the album already ranks #2 in Local Electronica, as well as #359 Nationally and 971 Globally! Not bad for an experimental side project. I uploaded to BandCamp because the other sites simply don’t allow for high quality downloads which I felt was important. BandCamp doesn’t allow for freebies however so, I set the price at a whopping $0. Appropriate credit has been given to cgMusic in all locations complete with a brief explanation of how this project came about. I will be posting a link back to this page on the ReverbNation site as promised. The videos are copyrighted, since Stupid Studios did produce them but the music itself is 100% FREE! I have a free version of CG Music. When I upgraded to Windows 10, the audio (sound) no longer is heard from my speakers or my headphones. (The program worked well in Win 8.1, pro 64 bit). I have another similar program, Easy Music Composer, that was installed at about the same time and it works just fine. Also my wav and Midi files play fine with Windows Player. Are you aware of any reason why cgmusic would stop working? Is there a possible fix? Thanks for ANY HELP! I too had issues after installing Windows 10. I also have the Pro 64 bit version. After much research and searching for a solution I found that it has something to do with the way windows creates the default midi out device. Download a sound font, download and install Virtual Midi Synth and set it up using the simple instructions (a link to easy set up is on the page). After you set everything up simply open cgMusic and create a new project. You should find everything working again plus, it sounds better than the old windows midi. CG Music delivers some of the most amazing midi music I’ve ever heard in my life! You are a true musical genius in every sense of the word, and deserve every bit of praise imaginable! I can’t even begin to express how wonderful this software program really is. It just blows my mind! This is a gem! Too good to be left in the past. Would be glad to carry the program forward if you are too busy. If not (reluctantly) I will start building my own. @sunil If you look a few comments back you will find people posting solutions to this problem. This is the first of 3 posts. I have created 2 scripts that will show you how to vary the volume for a rendered part. The first is the arrangement, and the second is the script that has a variable volume. The volume starts randomly between 66 and 80, goes up uniformly to between 120 and 127 and then back down uniformly. You can turn on the log to watch if you like. Add the first script in the arrangement directory and the second in the render directory. Minor (doric) Is this Dorian? @Danny Sorry for that. I don’t have any formal training in music, and English is not my native language. I was probably translating names from some Polish books on music theory. Anyway, the intervals are as follows: “minor (natural)” 2-1-2-2-1-2-2 | “minor (harmonic)” 2-1-2-2-1-3-1 | “minor (doric)” 2-1-2-2-2-2-1. I hope I got that right. I was translating directly from the source code, which wasn’t intervals. Thank you for the prompt response! Between your answers and analyzing the output of the MIDI files on my own, I have the answers I was looking for. Major (Natural) – standard diatonic Major mode. I hope this helps anyone else who is wondering. Than you very much for this !! great work Danny, i was wondering about the “soft” version. what tools did you use to dig into the midi files. I just open it in either GP5 or MuseScore. I can’t seem to get it to work on any of my 3 systems, all of which are Windows 10, though I’m really interested in giving this a try. I keep getting the MSVCP71.dll is missing error, is this because of Win10? I installed MSCCVP71.dll which is not in W10 or W8! despite installing Dot Net fx4. Even threw in a copy in the install directory alongside the angel.dll for good measure. run compat and W10 has come up with “Incompatible Application” I have removed the program as I am threw out all my 486 computers etc 🙂 Sayonara San 🙂 Would have been nice to see it just work a little bit in W8/10 c’est la vie. Hey Joe! Read comment #114. I am running the latest version of Windows 10 and it works for me. I would gladly pay money for this. As much as I love getting all of this awesomeness for free, I would love to see this developed into a hearty paid program. It would be worth it for the long term users and for ongoing development of new modules. Please take my money! I find it really restrictive & crappy that music I generate myself using a midi file I made with this would be unable to be used any way I please. Why do people feel the need to completely destroy freedoms & freedom of use, especially for something like this?! Because then, what is the freaking point? I just think it’s a really crummy thing to do. Why even bother sharing this if people can’t even use what they generate? I wont be using it. Sad to find another well-developed idea ruined by stupid licensing, terms or copyright crap. Leave that stuff where it belongs – in the trash. Just share…. sorry ur prog is not working cause MSVCP71.dll is missing;how comes?what can i do? If this crashes on launch, try to run it in WinXP compatibility mode. Then if it asks you for DLLs, you must copy-paste said DLLs from other software on your computer(searching on your whole PC via the windows explorer is the easiest way to do that). Better than all the rest . . .
It’s been awhile since the release of the program, hoping you can find a way to open-source the code to allow future development. I’ve translated the documentation into English, but I was hoping there could be some tutorials on script coding, some additional info about the inner engine calls or if you could find the time to write additional scripts. I am hoping to find a way to write music in the same vein as Zelda, a smooth sounding pastoral type song in the Lydian mode but I’m not sure how that would be done via the documentation provided. Do I have to obtain a license to use cgMusic’s generated music for *PUBLIC* non-commercial use?